among the highest trained doctors in their specialty areas in the state. Dr. Kimi L. Carson, Ph.D.
Dr. Pamela A. Counts, Psy.D. Dr. Heather M. Diaz, Psy.D. Dr. Miracle N. Goetz, Psy.D. Dr. Lori A. Holmquist-Day, Ph.D.
Dr. Anna M. Homen, Ph.D.
Dr. Dave S. Kerby, Ph.D.
Dr. Rachel B. Smiley, Ph.D.
Moore Counseling Center’s new facilities were designed by Sara Ward and her husband. Starting with hand-drawn plans, Sara and Dr. Ward created offices and common areas to meet the highest standards for an outpatient mental health facility. Our patients’ first impression of the MCC will be that it appears from the outside to be more similar to a home than an office building. This intentional design aspect was for the purpose of creating a feeling of warmth and invitation as opposed to the sterile, detached feelings of traditional medical offices. Our large parking lot accommodates 28 vehicles, providing easy, convenient access to the building for our patrons. 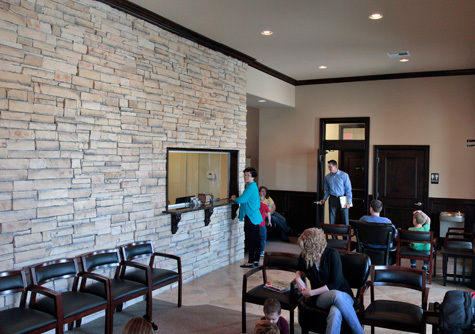 Upon entering the building, patients will notice the openness of the waiting room, accentuated by a 12-foot decorative rock wall. 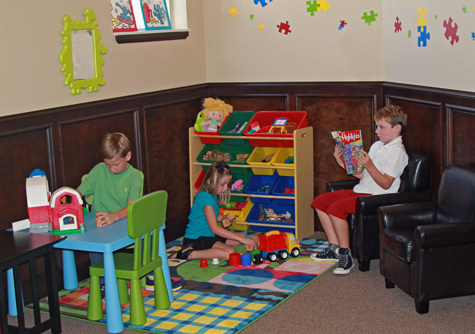 Maple wainscoting, leather furniture, and granite counter tops communicate the professional nature of our services, while a children’s nook provides relaxing entertainment for children as they wait. Once patients enter the clinical areas past the waiting room, they are unlikely to notice security and privacy details such as insulated walls, sound cancelling devices, locking storage spaces, and monitored alarms. Rather, patients report feeling at ease and comfortable, which as clinicians we know is essential for building effective rapport. 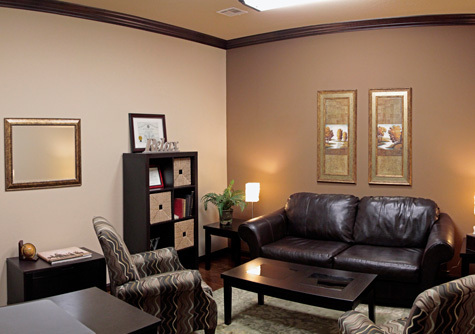 Patients are escorted to spacious offices outfitted with new furniture and decorations where they are able to relax and unplug from the stresses of the outside world for at least the duration of their session. The MCC stores all patient information on-site behind multiple locks and alarms, ensuring the highest levels of privacy and confidentiality. Also, for the security of its employees and patients, the MCC has a testing room that doubles as a safe room with 12-inch thick concrete walls and ceiling capable of withstanding an EF4 tornado. Essentially, the overall design of the Moore Counseling Center facility was meant to incorporate state-of-the-art privacy and security technologies in a manner that did not detract from feelings of warmth and hospitality, while facilitating the flow of services in a seamless, efficient manner. The Moore Counseling Center was incorporated by D. Gant Ward, Ph.D., in September of 2006, nine months after he was first licensed as a psychologist. Dr. Ward began as a one-man organization answering the phone, filing paper insurance claims, hand-writing notes, scheduling appointments, and seeing a few patients in what time was left over. As his caseload grew, in November of 2006 he renovated a large closet in his two-office suite at the Moore Medical Center to accommodate his first employee. A secretary was hired to assume many of the clerical duties, which allowed him more time to further grow the practice. In January of 2007, Dr. Ward filled the empty office in his suite with his first clinician employee. 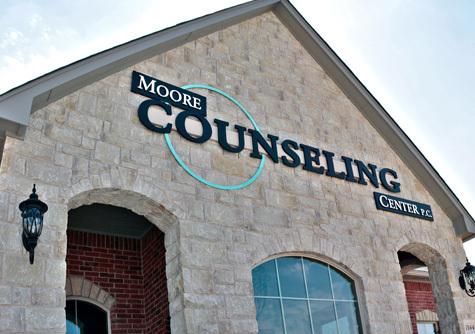 Due to consistently high patient satisfaction, the Moore Counseling Center continued to grow, leading to Dr. Ward’s decision in January of 2008 to expand into a five-office suite across the street from the hospital in the Classen Center. Dr. Ward hired his first postdoctoral fellow, Dr. Jennifer L. Morris, Ph.D., in September of 2008 to begin an autism program, having recognized a strong need for such specialized services in the state. Dr. Ward continued to add doctoral-level providers to his clinical staff, eventually filling the five-office suite with the highest trained mental health professionals in the state. After nearly a year of turning away business due to all five Moore Counseling Center psychologists having maxed-out their caseloads, Dr. Ward made the decision to buy a piece of commercial property and to build his own state-of-the-art facility from the ground up. Ground was broken at 1044 SW 4th Street in May of 2012. Dr. Ward hired three additional Ph.D. providers, a nurse practitioner to run the medication clinic, and a PCIT specialist. The Office Staff was expanded to include a full-time office manager and her full-time assistant office manger. Also, Sara Ward left her 10-year district management position in the corporate world to run the business operations of the Moore Counseling Center. 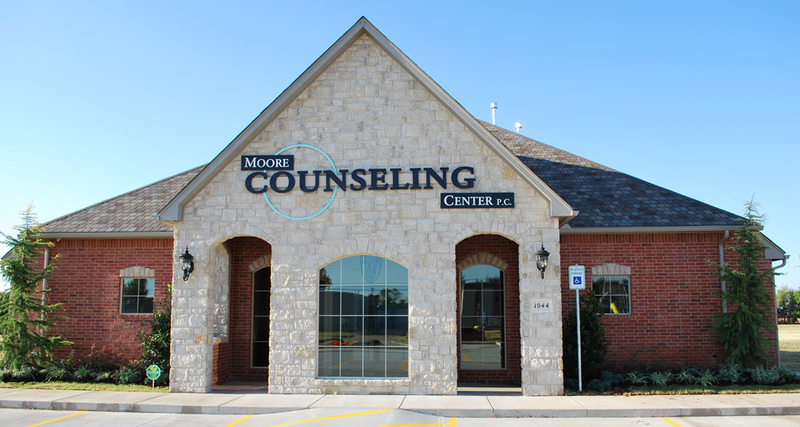 Today, the Moore Counseling Center has delivered services to over 6,000 patients, employs 14 individuals full-time, and continues to expand its mental health services for the Oklahoma City Metropolitan Area. The New Moore Counseling Center! We are located on a highly visible, highly convenient frontage lot on SW 4th Street near its intersection with Santa Fe. The building is 4000 sq/ft, comprised of a large waiting area, a large reception area, an ADA bathroom (and three provider bathrooms), 9 offices, 3 testing rooms, 1 PCIT room, and a break room. 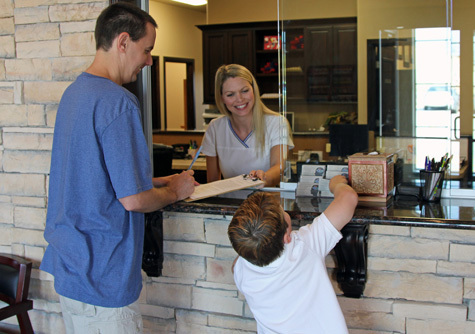 Patients checking in can expect a friendly, professional greeting. Our support staff is trained to provide the highest level of customer service and patient privacy and confidentiality. In an effort to make check-in a quick and smooth process for our patients, our intake forms are concise and non-repetitive. Copays and un-met deductibles are due at check-in. We accept most forms of payment, including major credit cards. Though our facilities were designed to be elegant and of high quality, we have a section of our waiting room devoted to making children feel comfortable and relaxed. There are many toys and books to entertain the kids while they await their appointment or while their doctor is speaking with their parent. The MCC waiting room has seating for 20 adults. The room was designed with a large entry air lock, a 12′ ceiling and a check-in window designed to accomodate two patients simultaneosly to add to the openness and comfort of the room. The ADA restroom is accessible from the waiting area, as is a water fountain. It was the intent of Dr. Ward and Sara Ward to establish the MCC as being one of the most pretty and fashionable psychology businesses in the state. This ambitious goal was achieved with new furnishings to meet customized designs, while maintaining the comfort and peacefulness that is requisite for effective psychotherapy. The furniture and design of the child offices were designed with children in mind. From 5′ high light switches, locking closets, anchored furniture, enclosed desk spaces, and maximized floor space, “the little things” were in mind to develop child psychology offices that are functional, safe, and productive. Some psychological tests are administered by the doctor with the patient present. Others are paper-and-pencil questionnaires that may be completed by the patient on his or her own. 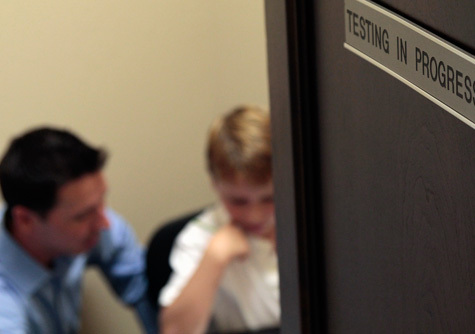 The MCC has three testing offices which are used for test administrations by psychological technicians and for the completion of paper-and-pencil questionnaires. 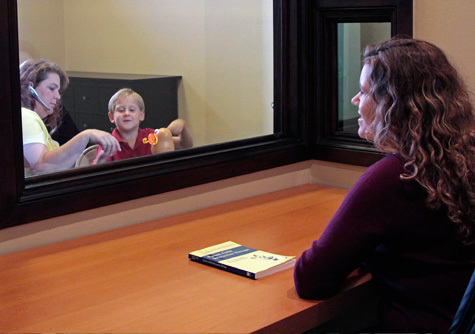 The MCC psychologists are experts in a range of psychotherapy theoretical orientations and techniques, including cognitive-behavioral therapy, interpersonal therapy, dialectical behavior therapy, and solution-focused therapy. Our doctors focus firstly on developing a strong therapeutic rapport with the patient. Then, effective clinical theory and techniques are skillfully applied to obtain the desired changes. At the conclusion of the visit, check-out is quick and convenient. If a follow-up session is to occur, one will be scheduled with the patient at check-out, and he or she will be given an appointment card as a reminder.